Can You Really Name All 5? Name 5 TV Dads... or 5 Tom Hanks movies. It seems simple at first but it's easy to get stumped! It's a social game that helps spark fun conversations. Can you name 5 things that can make a person sneeze? How about 5 TV dads? Vegetables beginning with the letter "a"? This outrageous quick-thinking game asks the questions you - think - you know the answers to. Sure you know 1 Tom Hanks movie, but can you name 5? We bought this to play with our residents in a nursing home setting and the staff wound up playing as well. Such fun. we use this game with my seniors they love it! 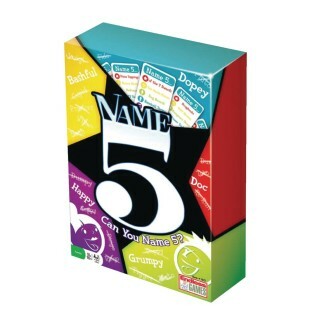 It is a great group activity and stimulates their minds and is a great social game that is really funny at times.